When it comes to nostalgia, Christmas has every season beat. 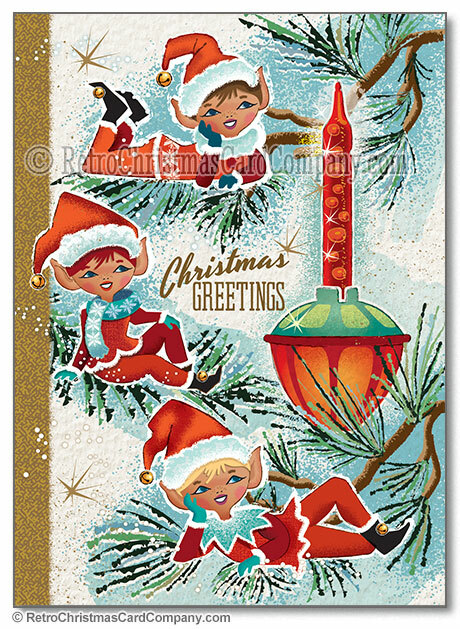 If you absolutely love Vintage Christmas Cards (first, check out our Free Victorian Santa Claus Cards, but then) check out these These amazing New Retro Vintage Christmas cards designs by Retro Christmas Card Company. I’m seeing these designs pop up all over Facebook, and with good reason! These bright colourful new mid-century modern Christmas cards invoke not only the happiness of Christmas’s past, but bursting with bright colours, a sense of happiness and celebration that some cards are simply lacking these days. 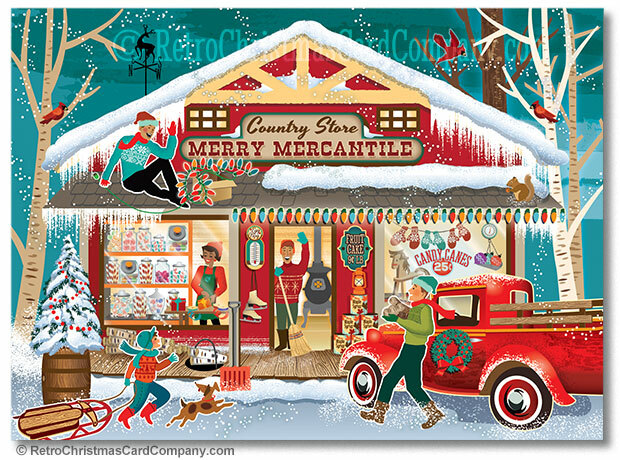 The vintage Christmas cards are designed in-house and sold directly (only to the USA, unfortunately). 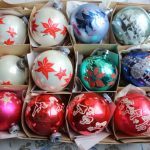 Have a look at a few of our favourites below, and check up on our Giveaways Page for more information about the AMAZING Vintage Christmas cards giveaway that Retro Christmas Card Company is hosting! These Jolly little elves are hanging about in a vintage tree, complete with the iconic Bubble Light we all know and love. Who can resist this amazing design? There’s just SO MUCH going on at this simple country store. 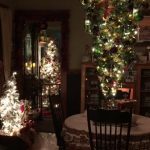 It’s got sweets, decorations, and that warm cozy cottage feel. I wish I could have a model of this for my Christmas Village! Santa, snoozing on an Eames… LOVE IT! The vintage ornaments and fireplace are just the icing on the cake to this amazing design. 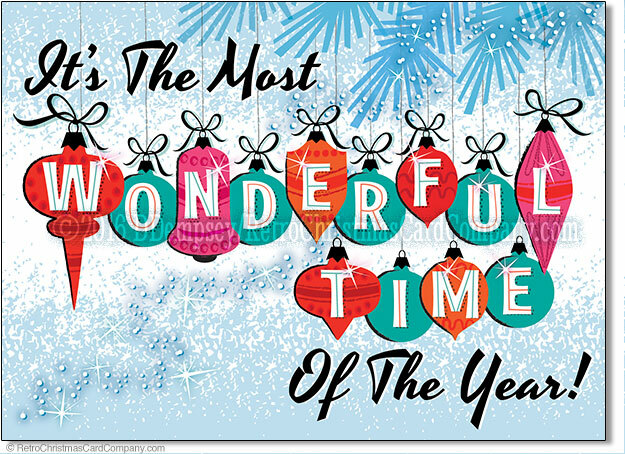 I have a feeling that this is one of the most popular card they have… the amazing typography along with the Vintage Christmas Tree Decorations are just too perfect! 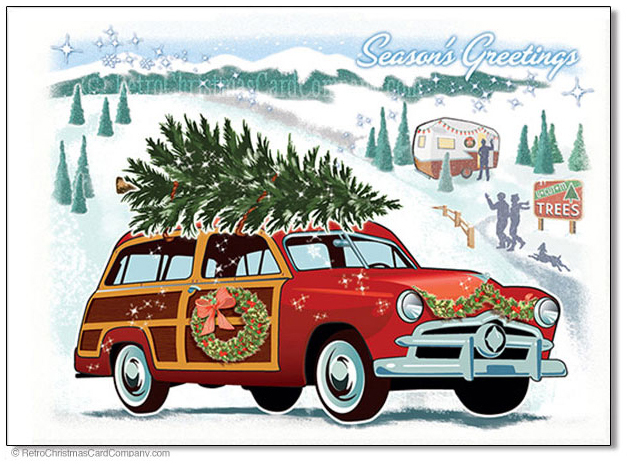 Is there anything more nostalgic than a wood-panelled car hauling a freshly-chopped tree home for the Holidays? I may not have grown up in the 50s, but this icon of the decade is timeless! 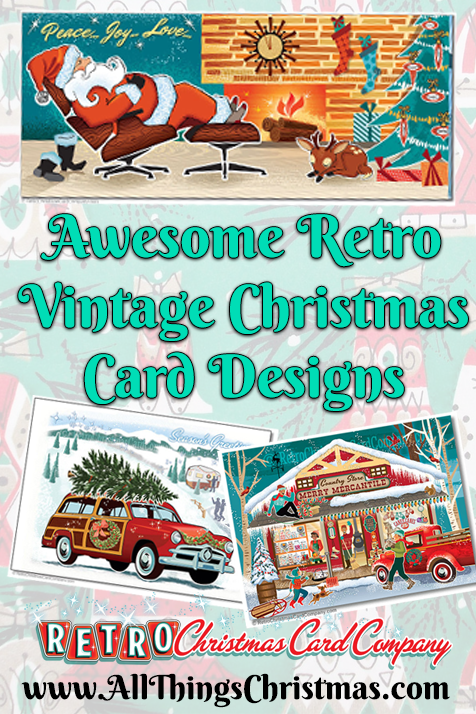 Don’t forget to check our Giveaways Page for details on how you could win these awesome Retro Vintage Christmas Cards! 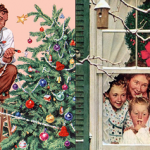 Do you have a favourite Vintage Christmas Cards design? Share on our Forum!